This beautiful Lissom pattern has been created by Karen Butler Designs (who also produces Literally Yarn) and is available as an online download (VAT inclusive). 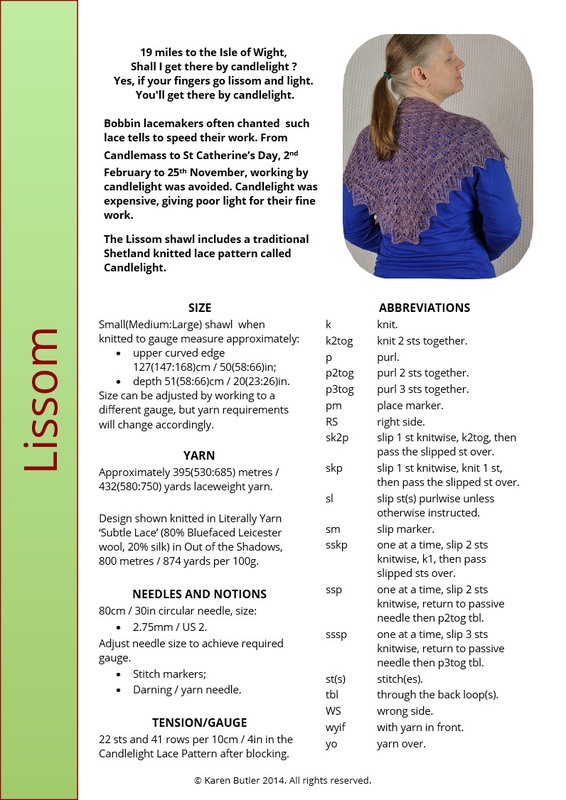 Lissom is knitted from the bottom up using traditional Shetland lace patterns. A length of Queen's Lace is knitted for the border, involving lace knitting on both knit and purl rows over a maximum of 22 stitches. Stitches are then picked up along the straight side in order to work the simpler Candlelight pattern for the shawl body, decreasing as you work. Join the remaining few stitches with either a 3-needle bind off or Kitchener stitch. The resulting shawl is triangular with an upper curved edge. The pattern contains both charts and written instructions for the lace. The pattern is downloadable in pdf format and can be viewed using Adobe pdf reader. A copy of this software is available at http://get.adobe.com/uk/reader/. Images have been provided by Karen Butler Designs. If you are a member of Ravelry and would like this pattern to appear in your Ravelry Library, please let us know your Ravelry username when you place an order. Design shown knitted in Literally Yarn ‘Subtle Lace’ (80% Bluefaced Leicester wool, 20% silk) in Out of the Shadows, 800 metres / 874 yards per 100g. They yarn used is hand-dyed Literally Yarn which is only available in small quantities in any colour. To substitute, choose a smooth lace weight yarn of about 800 metres/874 yards to 100g.